Line 8 x 8 inches pan with parchment paper and set aside. In a sauce pan over medium heat, combine butter, sugar, brown sugar, milk and salt. Whisking constantly bring the mixture to a boil. Boil for 1 minute then remove the pan from a heat. Add peanut butter and vanilla and whisk until evenly combine. Using a spatula or a spoon, fold in oats. Do not add all oats at once. You don’t won’t to make your mixture too dry. Add 2 cups, stir well, then add ¼ cup at the time if needed. The amount of oat depends on the brand you use. Keep in mind that the mixture will thicken and harden as it cools. Cool to room temperature, then place in the fridge to cool completely. To make the chocolate frosting, combine ¼ cup peanut butter and chopped chocolate in a microwave safe bowl and microwave until melted and smooth, stirring every 30 seconds. Or you could melt it in a small sauce pan over low heat on a stove top, stirring constantly. 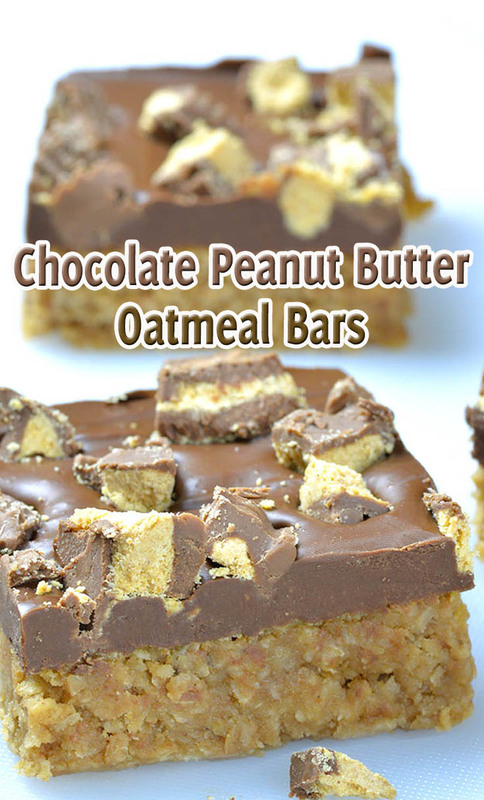 Spread chocolate mixture over the peanut butter bars, sprinkle with chopped Reese’s cups and refrigerate for at least 1 hour.